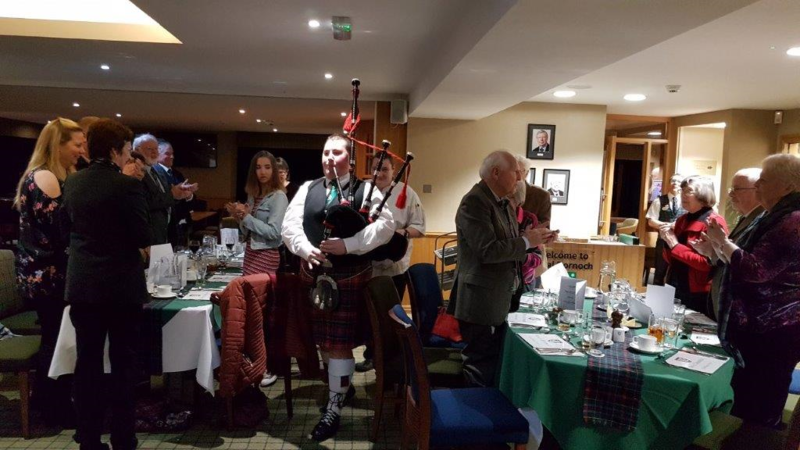 The Burns Supper season is in full swing across Sutherland and the world and amongst those held this week (23 January) was a joint venture between the Rotary Club of East Sutherland, the Tain and East Ross Club plus Royal Dornoch Golf Club. This was a truly wonderful event with superb speakers and wonderful entertainers. 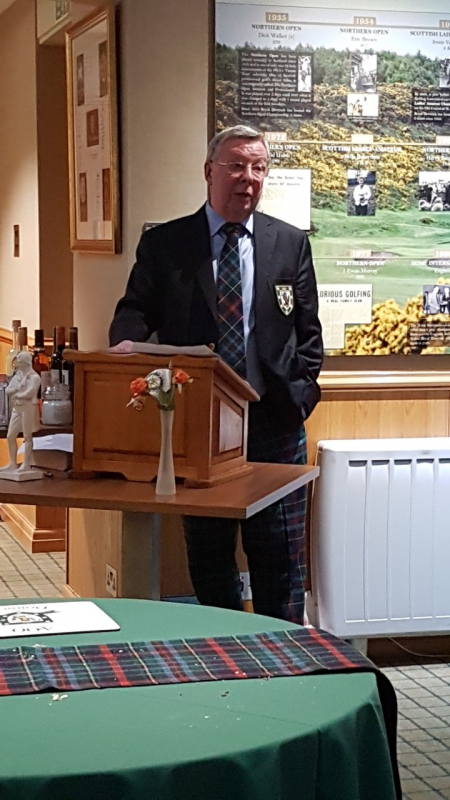 An Immortal Memory that was considered and informative as well as full of humour was delivered by Gordon Lawson the RDGC President –so good that even the first-time visiting Sassenachs were educated and well informed. Roger Boyce tried to take the high ground in a very entertaining Toast to the Lassies but his wife Sue took no time at all in bringing him down to earth with humour and a cutting wit. Alistair Risk kept the evening flowing with humour and with his lifelong knowledge of Burns and his animated Address to the Haggis gave the beastie no chance of escape! 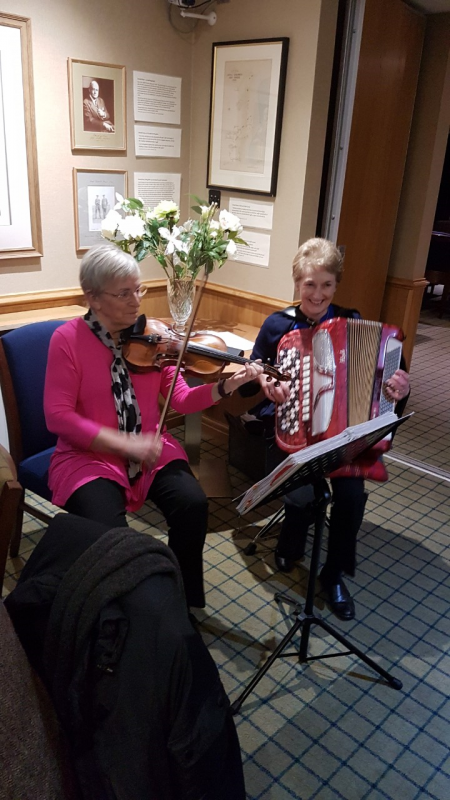 Monica and Trish playing fiddle and accordion were a delight. 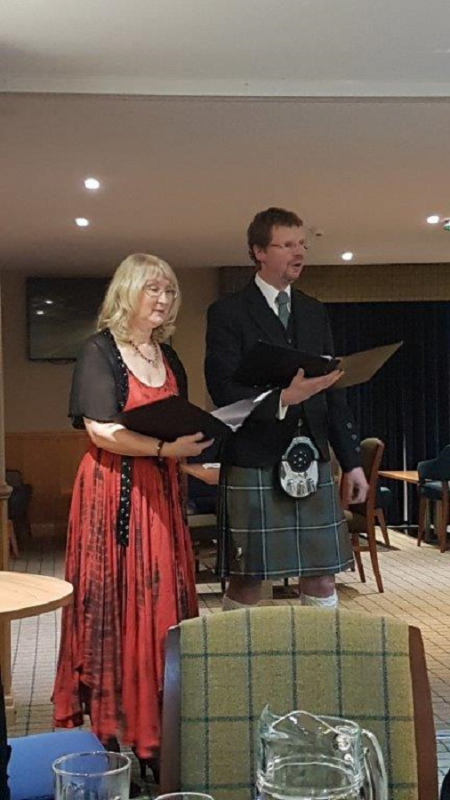 Elaine and Paul Griffith accompanied by the talented John Bronoski provided a tribute to Burns music that brought tears and joy as they sang love songs and others featuring Burns Country Pursuits? Lee Bain was a masterful Piper as he led in the Haggis and again on his solo spot towards the end of the evening. The evening concluded with Mark Sutherland Fisher delivering a masterful vote of thanks on behalf of a packed house. What a night, one that is sure to be repeated next year.